113 with her and attended to some errands. 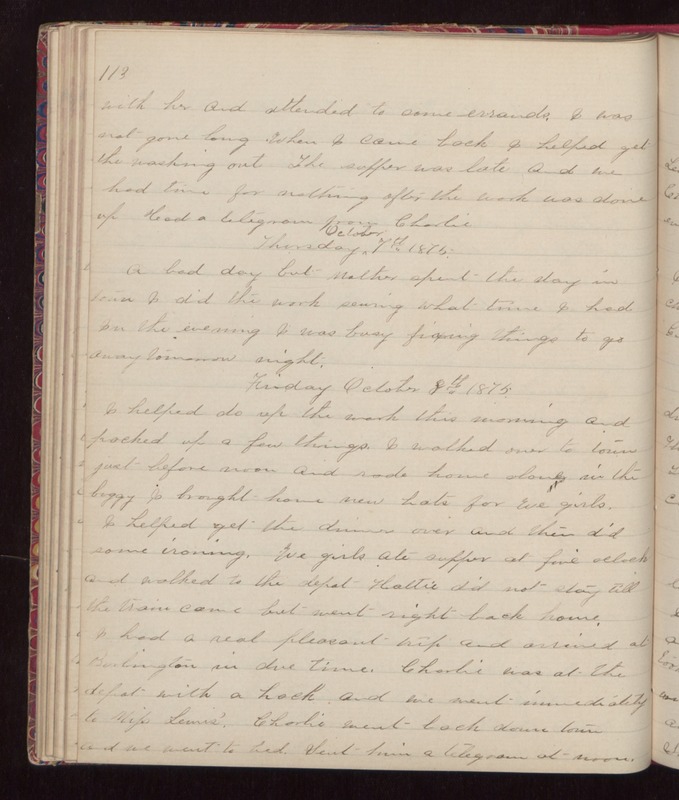 I was not gone long when I came back I helped get the washing out The supper was late and we had time for nothing after the work was done up Had a telegram from Charlie Thursday October 7th 1875. A bad day but Mother spent the day in town I did the work sewing what time I had In the evening I was busy fixing things to go away tomorrow night. Friday October 8th 1875. I helped do up the work this morning and packed up a few things. I walked over to town just before noon and rode home alone in the buggy I brought home new hats for we girls. I helped get the dinner over and then did some ironing. We girls ate supper at five oclock and walked to the depot Hattie did not stay till the train came but went right back home. I had a real pleasant trip and arrived at Burlington in due time. Charlie was at the depot with a hack and we went immediately to Miss Lewis'. Charlie went back down town and we went to bed. Sent him a telegram at noon.